We do our best to test in all environments, but sometimes there are setups and variables we haven’t accounted for with our apps. If you experience any issues and cannot find an answer below, please, please, please contact us! We will be in touch right away and will be making fixes as soon as we can! To streamline the checkout process, we accept PayPal! HOW MANY DEVICES CAN I USE THIS WITH? One license key is good for one device. You may purchase additional license keys by adding more of the App product to your cart. Your license key is good for the lifetime of the product. WILL THIS WORK ON WIN 10 COMPUTERS? This app works on devices with Windows 10 Tablet Mode and Desktop Mode. WHY ISN'T THIS ON THE APP STORE? Windows App store applications have limitations to what they do. One limitation being that they are not allowed to affect any other application running on your system. Since the purpose of the Auto-Hide Taskbar application is to affect other applications on your system, it would violate the Windows App Store terms of service, so it cannot be distributed there. Windows 10 devices with both Tablet Mode and Desktop Mode. 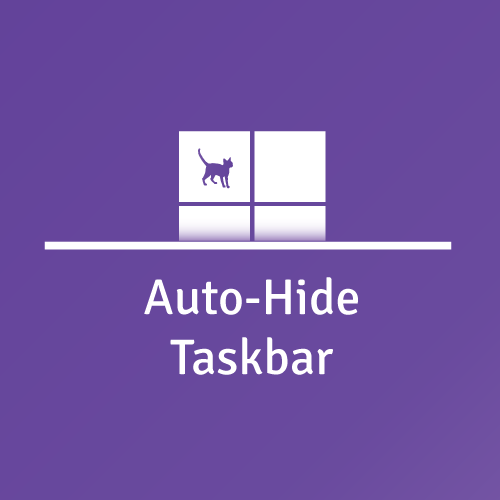 The Auto-Hide Taskbar app is $1.35 plus any applicable taxes. That’s okay. Proceed to checkout with PayPal using a guest account, where you can simply pay with your credit card – no PayPal account necessary. HOW CAN I ADD A LICENSE KEY? After you’ve purchased a license key, open the app and click the About button. Click “Activate”, then enter the email address used to purchase the key, and the License Key you received via email. WHERE CAN I ACCESS THE APP? If you launch it from the Start menu again it will detect the instance that is currently running, and show its main window. HELP! I'VE LOST MY LICENSE KEY! That’s okay! Visit the Lost License page to receive your license key again via email. For your security, the license key is not visible on your order page via My Account. There may have been a version update, so the file you originally downloaded is no longer available. You can always access the current download file by logging into your account through the “My Account” page, and clicking on View Downloads. WHY DOES IT SYNC WITH MY OTHER COMPUTER? There’s a feature called theme syncing in Windows 10 that causes this issue with multiple devices tied to the same Microsoft account. You just need to turn off the them syncing option with your MS account to prevent this from affecting the Taskbar on your other devices. To find this option, go to Settings -> Accounts -> Sync your settings -> Individual sync settings and toggle Theme to ‘off’. This is because there is a limit on the number of activations with your license key. If you reinstall Windows, please contact us and we’ll increment the number of activations available. If you did NOT receive your order confirmation email with the activation key, be sure to check your Junk/Spam folders. If you still do not see it, please use the Lost License Key form to retrieve your page. If, for some reason that email is not in your Inbox or Junk/Spam folders, please use the Contact form and we will email you the activation key right away. There are two ways you can create an account. Click the My Account link in the menu at the top of the page and use the Register form. Click the My Account link at the top of the page and enter your information. If you’ve lost your password click the “Lost Password” link. Log in to your account and click “Edit Account”. Type your new password under “New Password” and “Confirm New Password”. CAN I SEE MY ORDERS? You can view your Completed and Cancelled orders by logging in to the My Account page and clicking “View Orders”. Fix the resume from hibernation crash. A 3rd party library was causing issues. That library is now removed. Added better support for updates.